A necessary step for any musician or band looking to make the leap from the garage to the professional stage is to establish an online presence and build up a loyal following. Thanks to a number of website builders that offer easy-to-use drag-and-drop editors, creating a site to showcase yourself or your band has become a simple and affordable process that can be done rather quickly. When comparing between the leading website builders, you should focus on those who have offerings that cater specifically to musicians. Which features are important for musicians and how do the leading website builders stack up in these areas? Let's take a look. If you’re new to the website-building game, then you may be wondering how exactly the whole process works. Traditionally, when we think of building a website, we think of a web designer with technical expertise using complicated code to build a site from scratch. However, do-it-yourself website builders have eliminated the need to know code by providing ready-made templates that someone with no design experience can easily customize. For a musician starting a website, it’s important to peruse the website builders’ selection of templates to make sure that there are choices fitting for your style. A musician is not going to want to take a template designed for a lawyer and try to customize it. The aesthetic will be all wrong. Therefore, it is advisable to work with a template specifically designed for a musician or a band. A musician’s website should feature actual music above all else. Any website builder will allow you to upload pictures of your band and write a detailed description about what your musical vision is and what you believe in. However, these elements should be secondary to the music, which is what people are going to expect when they look up a musician or band online. A key feature to look for is a music player that can be easily added to the homepage, which allows visitors to the site to listen to songs, albums, or select playlists. Successfully spreading the word about new releases and shows depends heavily on social media channels, such as Facebook, and social sound platforms, such as SoundCloud. Promoting your music is a multichannel effort, and your website should be the headquarters for this effort. It’s advisable to have prominently displayed buttons to all of your social media feeds on your website’s homepage, and even a running scroll that displays your various social media posts all in one place. If a fan has made the effort to come to your website to learn more about your music or see where they can purchase songs and albums, you don’t want to disappoint them. An important feature that your website should have is digital downloads of your music, either at sample length for free, or at full length for sale. Your website should include an interface that allows visitors to download and pay for digital music, or at the minimum, include an iTunes button that will direct them to where they can purchase your music. Image is as important an element of a musician’s repertoire as is their actual music, and merchandise, such as t-shirts, is a key way to promote a band or musician as a brand. You may want to consider making your website an online store from which visitors can purchase merchandise. This will cost you more than a regular website, but the rewards may be well worth the extra cost. Now that we’ve described the extra features that are specific to a musician’s needs, let’s take a look at the leading website builders and see if they have what it takes to help make you a star. 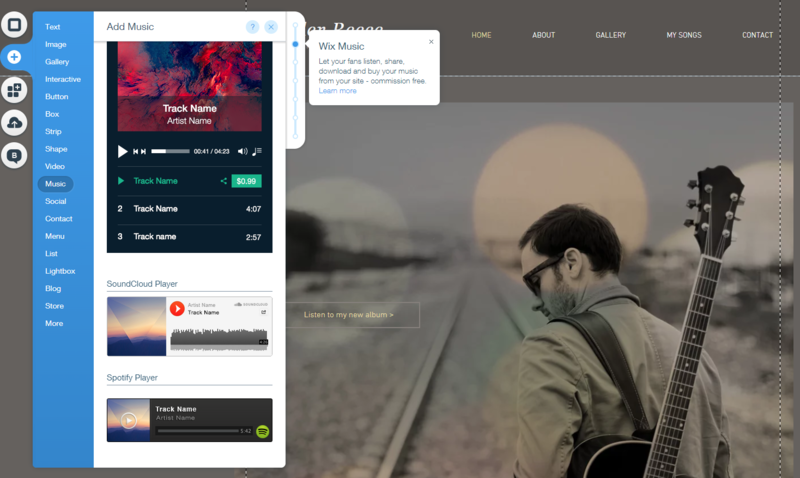 Wix​ has features specifically tailored to the needs of musicians and bands building their own websites. It starts with the selection of templates specifically for musicians—there are nearly 50 to choose from—and they are all easily customizable with Wix's drag-and-drop editor. There are templates designed to fit every genre of music, as well as those for sites to promote a specific festival or album, and templates for music management companies. However, looking the part is just part of the recipe for a musician. Wix also has features that allow you to easily upload music to your site that your fans can stream, download, or buy. Working directly from the Wix drag-and-drop editor, you can add the type of player, or players, that most suit you. They even have a Soundcloud or Spotify player that can be added to your homepage with the click of a button. You can add a single, organize songs into albums, or make playlists by uploading MP3, WAV, FLAC or ALAC tracks. Wix also gives you the option of easily adding an iTunes button and, through Wix app market, you can sell tickets and promote shows by integrating Bandsintown, manage and share an event or concert online with the Wix Events app, or sell digital music with the Sell Downloads app. In addition, certain Wix features that cater to all of the company’s users are particularly fitting for musicians. You can easily add social media icons to your homepage to promote all of your channels and have a feed on your website that automatically updates with your latest social media posts. If you want to sell merchandise on your site, such as t-shirts or posters, you can set up a Wix store, although you’ll have to opt for an Ecommerce plan, which costs $16.50 per month. 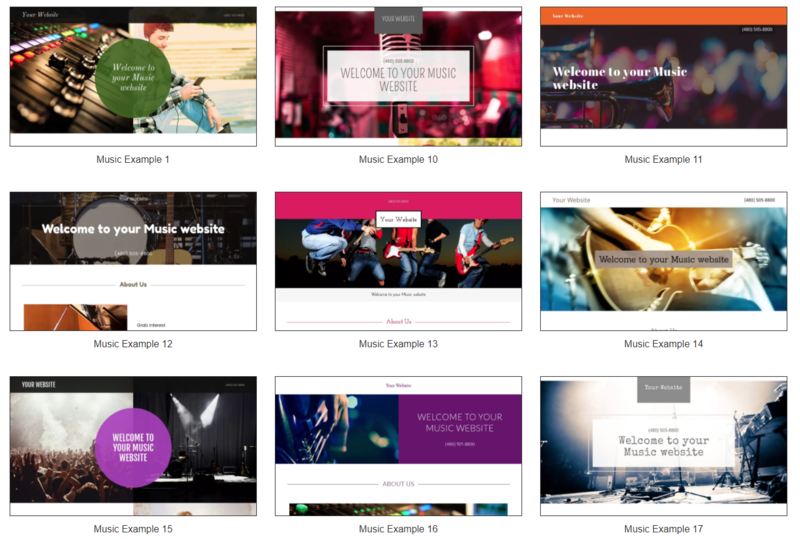 Like Wix, Godaddy​ has templates designed specifically for musicians. However, there are less than half the options that Wix offers, and the classifications for music type are not as specific. Still, the templates are responsive, meaning they will display nicely both on a desktop and mobile screen. The features that GoDaddy offers musicians are also not quite as extensive or friendly as those offered by Wix. For example, you can add an audio player to your site and upload music, however, this option is only available for those who have subscribed to GoDaddy's Business or Business Plus plan. Files are limited to 10GB for Business Plan subscribers and 50GB for Business Plus subscribers, and MP3 is the only file type that is supported. Weebly​ does not have templates that are specifically designed for musicians, however many of its portfolio, personal and blog templates are fitting for a musician or band site. Weebly’s own audio player element is quite limited, allowing only MP3 files for those who have upgraded to Weebly Pro. It can also only display one track at a time. Those who wish to incorporate a player with a full playlist to their sites will have to opt for a third party app from Weebly’s App Center. There is a free version of the POWr Music Player app that you can add to your Weebly site that gives you good audio streaming options. It allows you to upload MP3s to your site or take music from SoundCloud to put in the player. A plus for Weebly is that you can sell either digital or physical music on their relatively cheap Starter Plan, which is $8.00 a month, if you sign up for an annual subscription. This is only for 10 products, however, and you will have to upgrade to a more expensive plan if you want to sell more products. You can accept payments through PayPal or credit card with Authorize.net, Stripe, or Square. As a musician, your website should be a portal for fans to hear your music, buy your albums and singles, get your cool merchandise, and interact with your social media channels. While both GoDaddy and Weebly provide some of the features needed to make such a website a reality, they are not nearly as comprehensive as Wix. Wix goes the extra mile for musicians looking to build a website, starting with their impressive selection of templates catering to every genre of music, and including their music players that are easy to work with and support a number of file types. Taking your music career to the next level has never been easier. 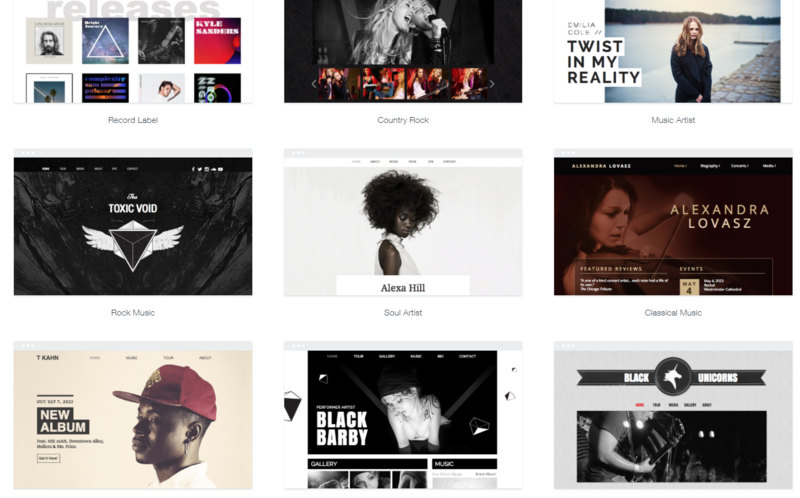 Build your band’s website with Wix right now and give your music the exposure it deserves.